The myBOT is alive, now it's your turn to do exciting projects with it! This document describes where you should start if you're thinking about building your own myBOT. The Mathematical Model used for the myBOT is discussed in the attached "myBOT_BachelorThesis_AdrianSchmid.pdf", Chapter 4. There are two ways to implement the myBOT in Hardware. At the end your myBOT should look similar to those two guys. the left one is done using the Digilent parts (uncabled), the right one is done using the 3D printable parts. To build your bot you have to 3D print both, the "Chassis" and the "Cover". 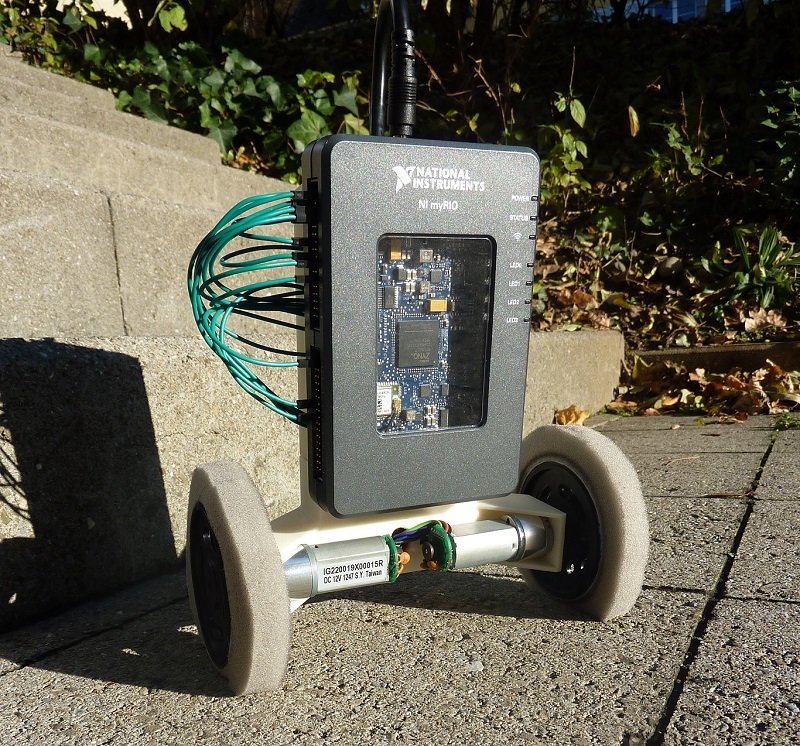 The 3D printable myBOT has been developed by a group of students at TU-Darmstadt. 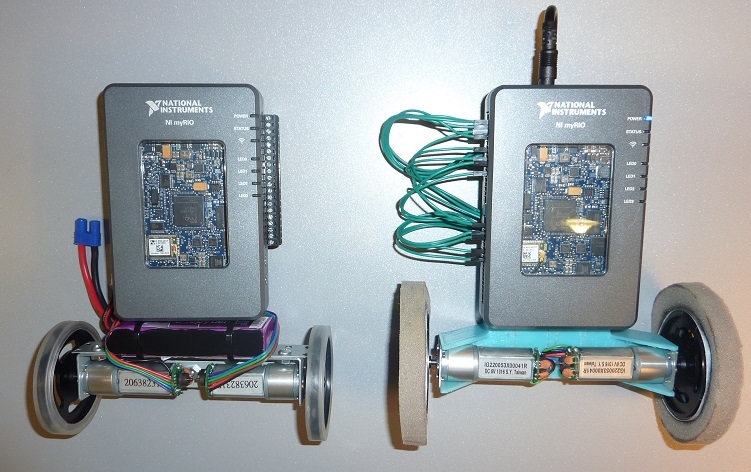 The myBOT on the picture on top has been done using the 3D printable housing. The CAD files attached only work with the 1:19 gear ration motors. If you wish to work with 1:53 ration, you should increase the gap between the two motors by 10mm. Otherwise the motors won't fit. Also the wholes for the motor cables and the myRIO Power cables are a bit tight. To fix this you can use a rasp on your 3D prints (as I did) or change the CAD parts a bit before you print them. If you do so: Please upload the CAD files to the community, so others can benefit from your work! Thanks. 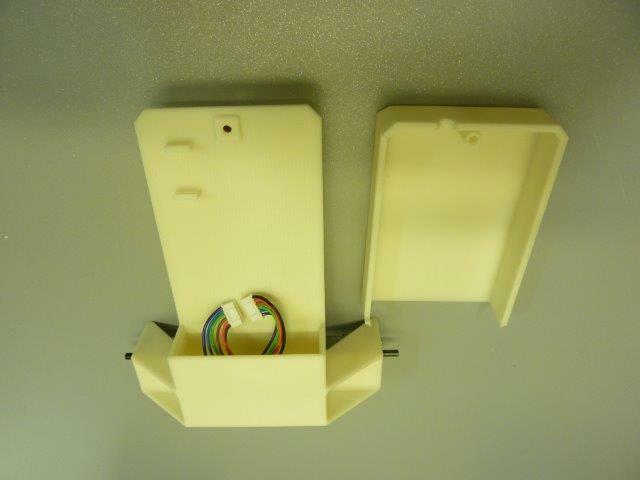 The Parts on the Picture above are printed on a "Dimension SST 1200es". A good option is to get your parts at http://www.teilefabrik.de/ . Ask for the "Dimension SST 1200es". Additionally to the two printable parts you need some Digilent parts for your myBOT. That's it. Well, you need some more small things. A bit of foam to build some soft tires for the myBOT and some cables to do the cabling stuff. Build the myBOT from Digilent parts. The other solution is to build the myBOT from Digilent parts. Please refer to https://decibel.ni.com/content/docs/DOC-30571 for the building instructions. The Scheme for the Cabling of the myBOT is attached (myBOT-Wiring.ms13). Attached is a fully functional myBOT Software version "myBOT - v1.zip". Connect your myRIO to your computer, and deploy the main vi "myBOT.vi" to your BOT. You're ready to go! Attention: The attached version of the SW is prepared for the 1:53 ratio motors. If you're about to build your myBOT with the 1:19 ratio you'll have to change some constants. If you're unsure about building the myBOT, start with a simulation first. The attached "myBOT-Simulate-v04.zip" contains a LabVIEW project with all needed VI's for the Simulation. The project is compiled for the use with LabVIEW 2013 myRIO Edition. Re: myRIO Balancing Robot - Getting Real!